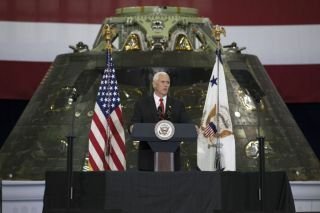 Vice President Pence visited Kennedy Space Center last summer to discuss the Space Launch System; he'll visit Johnson Space Center in August 2018 to update the country about the administration's plans for human spaceflight. Vice President Mike Pence will take the stage today (Aug. 23), to offer an update on the Trump administration's plans for human spaceflight. Pence will speak at NASA's Johnson Space Center (JSC) in Houston, with his remarks scheduled to begin at 1:45 p.m. EDT (1745 GMT). You can watch the speech live on Space.com, courtesy of NASA TV. In addition to his role as vice president, Pence is also the chairman of President Donald Trump's National Space Council, an advisory group for space policy issues. NASA Administrator Jim Bridenstine will accompany the vice president on his visit to the facility. The event will focus on "the future of human space exploration and the agency’s plans to return to the moon as a forerunner to future human missions to Mars," according to a NASA statement. The vice president's scheduled comments come amid a flurry of activity regarding human spaceflight. Last week, Lockheed Martin revealed work on its version of a prototype for a human deep-space habitation unit, and the Orion spacecraft that will carry those space travelers got its heat shield. Earlier this month, JSC saw the announcement of commercial crew astronaut assignments to test flights and maiden International Space Station missions due to take place next year. These developments and Pence's remarks this week all reflect Space Policy Directive 1, Trump's order that NASA focus on sending humans to the moon as a forerunner to eventual Mars missions.